The afternoon temperatures where I live seem to challenge the fact that the first day of fall is just around the corner.
) I was surprised to see the bags of bulbs on display. As I rushed past them, I found my thoughts drifting to another time. memorial service. There they stood ~ gardening tools in one hand and bags of bulbs in the other. They simply announced that they had come to plant bulbs for spring flowers. There was something so symbolic in their work that day. I watched through the living room window as they dug down through the cold dirt. Carefully they placed each bulb in a warm bed of earth just below winter's chill. And there the bulbs completed their winter rest ~ protected from the last blast of cold air, warmed by the ground which entombed them. It was not many weeks before I noticed the first push of tiny plants through the dirt in the garden. Then the thin stalks began to grow and buds appeared. Sure enough ~ as winter became spring ~ so the buds on the stalks opened to reveal the beautiful display that had been tucked away in each bulb. As I reflect on the bulbs planted in my garden that winter in 1996, I am amazed how the experience often parallels my own life's journey. Each of those bulbs is really a dwelling place ~ formed to protect the beautiful plant from winter’s chill, just waiting to be roused by the warmth of spring. The bulb also contains nutrients to ensure the plants' survival during its winter nap. Many plants that grow from bulbs are perennials. Although each will die back to the ground during a dormant period, they are protected from the harsh realities of winter, as they wait for the promise of spring to bloom, year after year, at their appointed time. And so it seems with my life ~ the seasons come and go. I know there will be winters to endure, times to nurture and renew my soul. And at an appointed time, the warmth of spring will bring forth the beauty of redemption and restoration. where dwells the mysterious essence of his being. of this Easter season. Holy Week begins on Palm Sunday with Jesus exalted as he rides through Jerusalem only to find his body buried in a tomb on Holy Saturday. And in between, Mary watches her son beaten and scorned, nailed to a cross. “Woman, behold, your son!" Then he said to the disciple, “Behold, your mother!” And from that hour the disciple took her to his own home. Mary and the others who find the tomb empty and realizes the fulfillment of Scripture and the hope of resurrection. Yes, life in His Kingdom is full of contrasts. Those who mourn are comforted. Those who grieve have hope. Those who die in Christ are truly alive. but February's the shortest one. until Leap year gives us twenty-nine. I am not sure when I actually learned this short poem from my mother. I just remember knowing it most of my life. And I have used it in many ways over the years ~ to know the date to write on checks, to plan vacations, to find the 100th Day of School in my classroom, and to help my students learn the number of days in each month. I remember thinking as a child ~ the first three lines have an arranged pattern of rhythm, a sense of completeness and predictability of what sounds come next. All the rest of thirty-one. These three lines were the easiest to memorize. But the remaining three lines have always stumped me. The rhythm of the poem seems to change in those last three lines. The words seem crowded. Little did I know what a word picture this poem was to become for my life. My February, as with the pulse of this childhood poem, is marked with syncopation rather than a predictable beat. The rhythm of its days has been modified and my focus is drawn to weaker sounds. They are the sounds of mourning and groaning and loss. 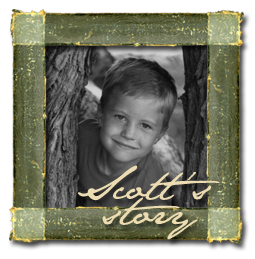 For February, in its short twenty-eight days, marks the sudden death of my son, Scott, as well as the death of both my mother and father. So, as each February comes around ~ like struggling to make the words of the poem conform to the rhythm of each line ~ I slow down and consider how best to experience the full weight of these losses and redeem the days to come. I'm sure the song elicits a range of emotions. Some will head home to the smell of grandma's cookies and to find their stockings still hung by the chimney with care. Others will gather together with relatives coming from near and far. ~ long after the music stopped. Assumption #1: We each have a home to which to return ~ a significant, memorable place where you and yours gather for Christmas. For some, their home was memorable for all the wrong reasons. Assumption #2: The weather will cooperate to produce a White Christmas ~ another one of Bing's famous recordings. Assumption #3: There will be presents under the tree ~ regardless of the balance in one's bank account. Assumption #4: A home is filled with so much love that it creates a love that glows. Assumption #5: Circumstances and surroundings are what makes Christmas special. No, my heart is not two-sizes-too-small! Believe me, when it comes to being sentimental, I am right near the top of the list. in an assumptive world. And our assumptive world almost always disappoint us. in heaven to be born in a manager. Christmas is not about dreaming and wishing you were somewhere other than where you are right now. Christmas is filled with promise and hope. For it is the very Babe of Bethlehem who has secured an eternal home to everyone who believes. I know there are times it is too much for me to even think about redeeming the future; when today is just too overwhelming ~ I hope I can just survive the present. You know those kind of days. You are or you have been the mother of small children and you do not have one.more.ounce of energy to offer. You have deadlines and responsibilities that seem to consume every brain cell. You are battered with images from your past that rob your joy. The memory of someone loved who has died opens that hole in your heart to allow all your strength to drain away. The future just looks hopeless. I know there are times I just want to survive today. I cannot think about redeeming tomorrow. I am grateful for God's promises in Lamentations 3:19-24 when I encounter these times. Remember my affliction and my wandering, the wormwood and bitterness. Surely my soul remembers and is bowed down within me. This I recall to my mind, Therefore I have hope. The LORD'S lovingkindnesses indeed never cease, For His compassions never fail. They are new every morning; Great is Your faithfulness. "The LORD is my portion," says my soul, "Therefore I have hope in Him." How precious, how refreshing, what a hope-filled picture, as I face one of those kind of days, to know He is the great I AM, offering His lovingkindness and compassion, renewing my hope, and filling my portion. I know I will have days where I do not have one.more.ounce of energy to offer; where it seems every brain cell is consumed with deadlines; where the brokenness of my past robs me of the joy here and now, my strength is simply draining away, and I feel hopeless. When those days seem to find us without the energy, joy, strength and hope we need, may we dwell on the promise of His strength for today and His bright hope for tomorrow. As we wait on Him to renew us, restore us, fall a fresh on us ~ as we survive today ~ we ARE investing in the future that He promises to redeem in His perfect time. In "Grace", "Hope", "Redeem", "Survive"
Easter stirs so many emotions for me. It seems my reflections are intricately woven with the events of Jesus' last week on earth. As I approach Holy Week, I feel myself drawn to Gethsemane. It is a place of protest, you know, where Jesus went to ask the Father to let this cup of death pass from him. I have stood among the old olive trees in Gethsemane on a trip to Israel in 1997. The year before, I quite literally found myself begging God to let the cup of death pass over our family. I have laid a precious life in the lap of Abba Father and uttered the words,"Not my will but yours be done," as I learn to trust Him with the pain. As I awake on Good Friday, I find myself identifying with the sorrow of Mary, whose son's life is slipping away as he hangs before her on the cross. And yet I find comfort in the words Jesus speaks to her in John 19:26, 27. He sees her tears, and looking down from the cross, he meets her in the form of her need, to fill the deep void created in her mother's heart. In that day you will ask nothing of me. tomb. I praise Him for the promise of resurrection, the hope of reunion, and the Kingdom where he will . . .
Will you join me in praying for our dear friends again? Eli has shown slow but gradual progress for the past 3 weeks. Today was the day to extubate him, to try to take him off the respirator. "Eli was taken off the respirator this afternoon. That was about an hour and a half ago. He's struggling quite a bit, so there's very real concern that he'll have to be re-intubated. His voice doesn't work yet, but he's constantly crying... a silent cry, but his face still shows the struggle all too well. This is pretty hard to endure." You may remember, Eli had open heart surgery at 2 days old to replumb his heart to a 3-chamber heart. He has been in PICU since he was born, 3 1/2 weeks ago. Eli's parents, Tanya and Jason, ask for prayer that Eli will have the strength to breath on his own, and that they will know the will of God. My own prayer is that Tanya and Jason will feel the everlasting arms of God holding them as they wait upon Him to reveal His perfect will. great is your faithfulness. "The LORD is my portion,"
says my soul,"therefore I will hope in him." In "Baby Eli", "Hope", "prayer"